became a true multipurpose workspace. designated smoking area out of the weather that can accommodate up to eight Valhallans at a time. Perhaps best of all, the new Park Lounge has been designed to insulate a large northern stretch of the Valhalla Main House from snow and ice storms during the harsh winter months, thus representing an unique heat-saving feature that will further reduce our energy consumption. So, it all started with a simple wish for a clean counter, particularly with hunters in mind. 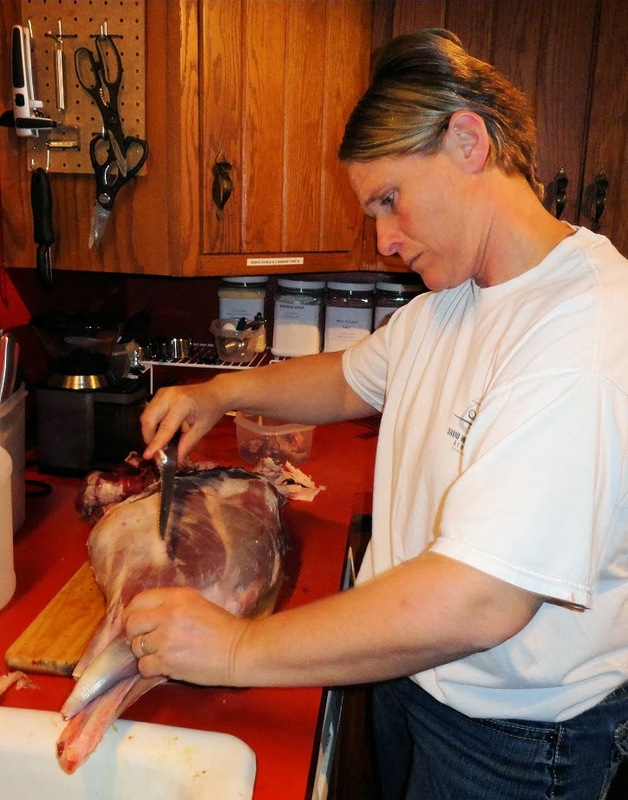 Note that over the past year over 80% of the meat eaten at Valhalla has been either raised here on the property or come from wild animals during the hunting seasons. Neighbors Doug and Dorothy donated steaks, chops, and ground beef from one of the bulls that previously grazed in our pastures. Stan and Maureen from just down the road brought ground lamb and lamb chops from one of their own sheep. Turkeys, chickens, and ducks from Valhalla's own flocks have been stir-fried, baked, grilled, and stewed. 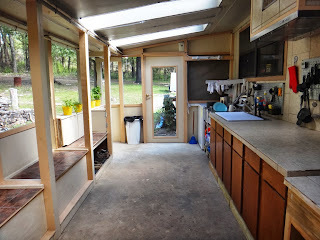 Valhalla's existing kitchen, Spring 2012. No wonder she looked a bit unhappy. Then wild venison steaks, chops, and stews are very common at the dinner table. With a standing herd of approximately 50 deer on these 200 acres (at least some of which ate everything literally out of Valhalla's 16 raised vegetable garden beds just before harvest time in 2012, and just before the fence was put in), two or three deer is not only a sustainable practice but also vitally important to keeping our freezers filled while on a tight budget. A large wild pig that had been tearing up the pond last year also found his way into many delicious pots of beans, as well as homemade empanadas and a large skillet of Filipino pancit. Hunting season therefore provides an essential source of wholesome protein-rich food. Unfortunately, Valhalla really didn't have a proper place to butcher, process, and package up wonderfully fresh meats. Chickens and ducks were typically cleaned in the kitchen sink, which was very messy. Sergeant First Class Michelle had to cut up a venison leg on a tiny patch of available counter space under the kitchen cabinets, which wasn't either comfortable or practical. What Valhalla has desperately needed was a clean, sanitary, oversized counter with a dedicated stainless steel sink -- plus hot water to go with it. But where could we build such a critically needed counter in time for the 2013 hunting season? It was hot when we had this debate early in the summer, and hunting season seemed a long way off. The biggest question came down to the practicality of running electricity and plumbing lines to such a space, which clearly indicated a need to build something right up against the Main House. But... where? a roosting and go-crazy area without permission. It was a mess. The answer was staring everybody in the face: the nasty dirty little porch just outside the dining room on the north side of the Main House. To tell the truth, nobody really wanted to go out there unless they absolutely had to, since the turkeys and chickens had taken it over as their own and joyfully pooped there a lot. We had previously tried to make it a workshop area, but the poultry flocks kept stealing our tools and making a real mess of things. Heck, on the other hand, that little dirty patio at least had a roof over it, and even a row of four 1970s-style skylights in the low roof to let light in. 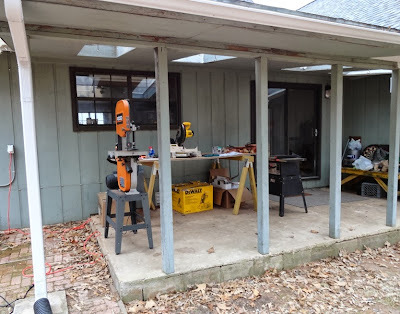 Sure, the concrete pad was way too short and in very bad shape (we found out it sloped over 2" towards the house, a disaster we'll mention later), but maybe we could extend it a couple of feet or so. Bill Yates from T Lazy T Farm had donated a lot of old kitchen counter cabinets from a remodel job that we could use for the new counter, and our friend Keith Hurst had found some wonderful double-paned French doors for Valhalla that could easily keep the birds out if we enclosed the patio. another 5' of workspace. The 3' island on the right is in progress. 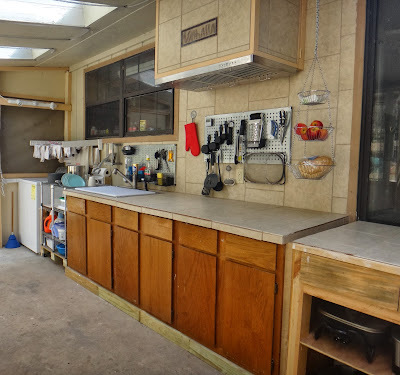 The 8' long tiled counter with a built-in stainless steel range hood over it has enough space for several people to comfortably participate in butchering and packaging projects at the same time. 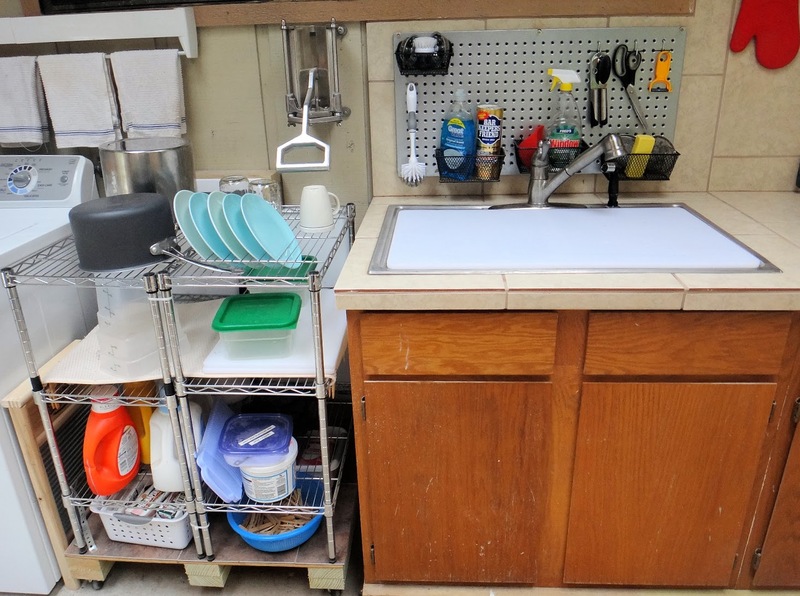 This primary countertop is augmented by oversized cutting boards that fit over the utility cart and clothes washing machine in the far corner, extending the workspace to 13'. An additional tiled island on wheels (still under construction) expands the total counter space to over 16' long. "Valhalla" for the tile hood cover. Over the past two years Valhalla has collected a wide variety of electrical appliances that can be used for cooking on this counter: an oversized electric frying pan, hot plate, large wok, grill, crock pots, sous vide water oven and more. 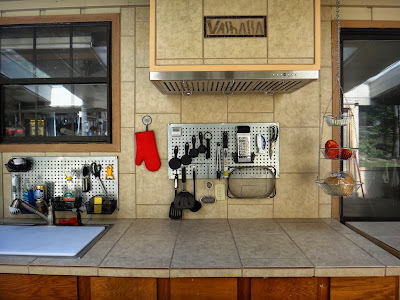 The standard range hood vent was replaced with a fireproof insulated metal stovepipe and the back wall was also tiled, thus allowing propane grills and cookstoves to be safely used in case of electrical outages. just inches away from the main cooking space above. 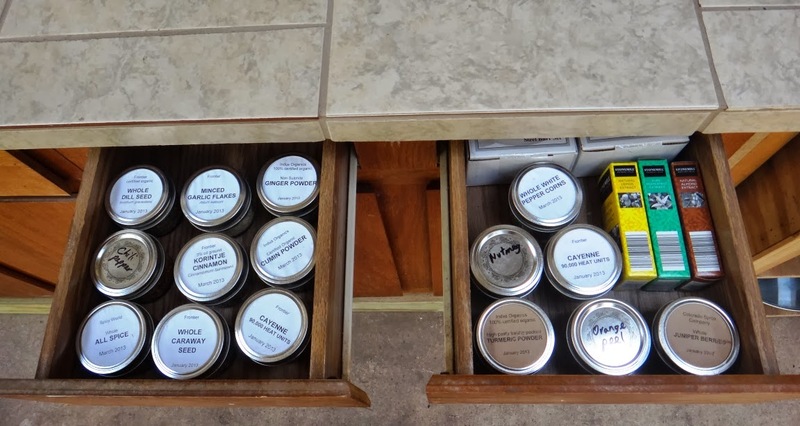 Herbs and spices are kept in the cabinet drawers (many more than are shown here, filling a total of four drawers). The cabinets down below them are used to stow away particularly heavy appliances such as the .35 horsepower LEM meat grinder with all attachments and a commercial quality Weston vacuum packing system. Two small wire shelving units were mounted onto a wheeled platform that slides out so one can more easily access items in the back. The top and middle shelves can be used as a rack for drying dishes, although the 30" long cutting board sitting over the sink in this photo can also be placed across the top of the cart to provide additional workspace as needed. Laundry supplies fit on the lower shelves next to the high efficiency clothes washer. the way to become a convenient towel rack. 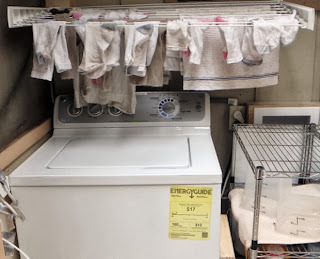 A series of clothes lines are used to dry laundry here at Valhalla to help save energy, and smaller items -- socks, dish towels, underwear and the like -- are typically hung on the hidden rack mounted above the washer. This rack folds up out of the way against the wall when not in use to become a simple towel rack (see previous photo). When it's time to fold laundry the large 30" cutting board is placed on top of the utility cart to make it into a handy laundry table. as many clothes when necessary. Larger items are dried on a clothes line tower on wheels, which also folds up flat when not in use. The tower can hold a jumbo load of laundry or several smaller loads all at once, which is very useful when several Valhallans want to do their laundry on the same day. 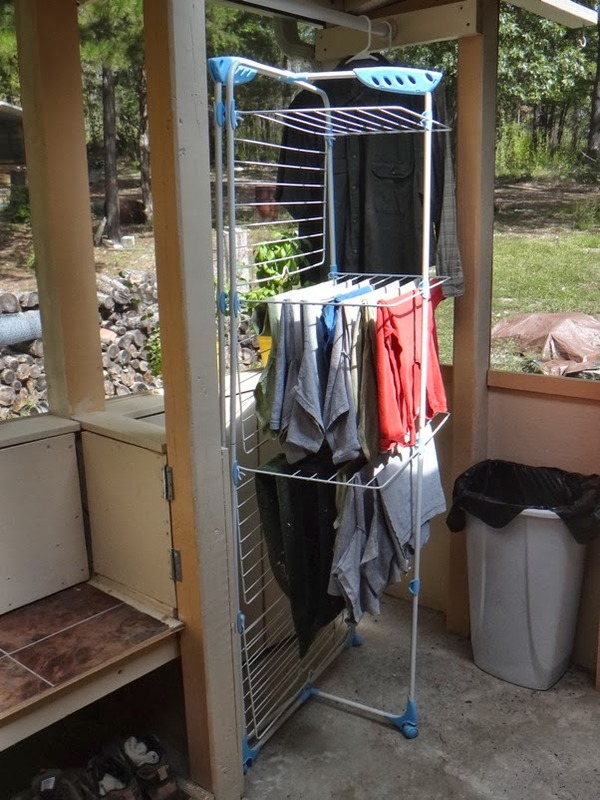 Valhalla's bunkhouse that houses up to three people at a time also has it's own laundry drying rack that is kept in the wet room (that is, the completely tiled roomy bathroom that can accommodate the needs of those with physical injuries or mobility challenges). Another drying rack could also be used up on the deck of the loft for use by an additional three Valhallans, although so far the tower rack by itself has been able to handle multiple loads of laundry. bench storage lockers for additional seating. The bench side of Valhalla's new Park Lounge provides storage space -- and some hidden surprises. 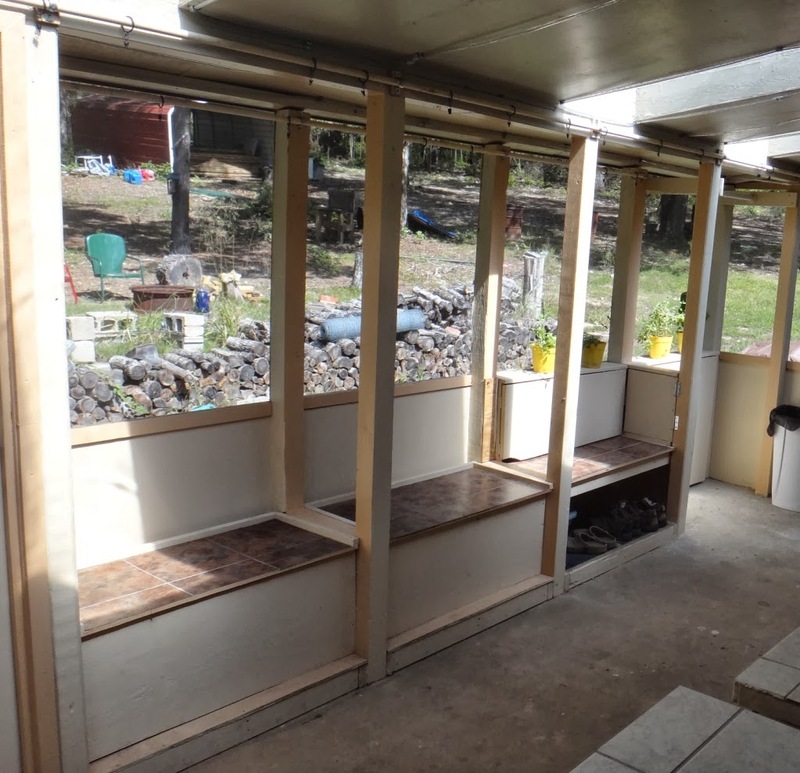 The tops of the two benches on the left lift up to store several folding camp chairs and other items. 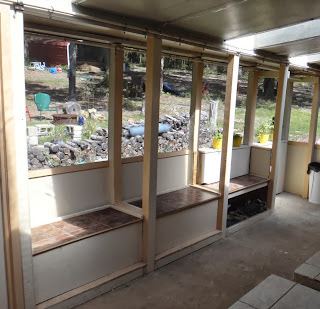 The third bench on the far right has been lined with hardware cloth to store and help dry muddy boots and other footwear. 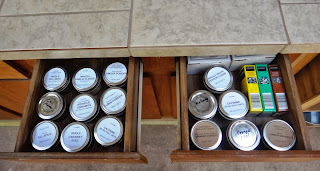 The back of this third bench as a small pantry built right into it so that anyone cooking will have immediate access to various ingredients without having to go in the house. Lounge. The backs of the pantries have been insulated with styrofoam to prevent freezing in the winter. 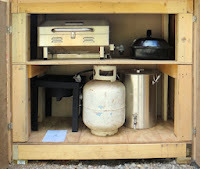 The locker on the right stores propane and related items. 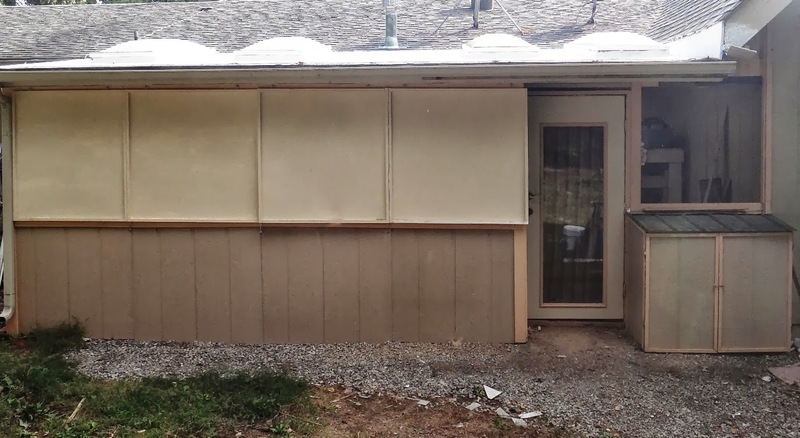 There is one additional storage locker on the outside of the screened-in lounge. 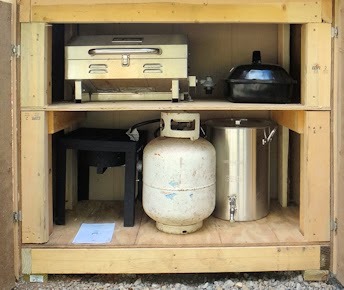 This is where a propane tank, turkey fryer, and a table top grill are stored. The fryer is used to heat water for scalding poultry so that their feathers can be removed. 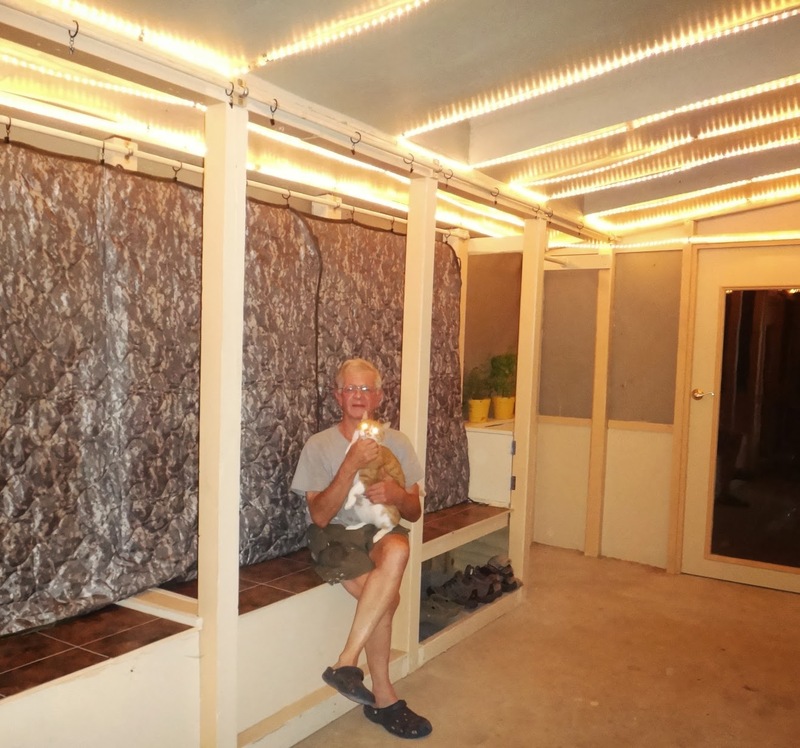 Since the Park Lounge is essentially open with screened in to keep the chickens, turkeys, and flying insects out it was necessary to tackle the issue of how to keep the cold out -- and away from the house -- during the winter. Plexiglas panels were highly desirable yet out of reach of Valhalla's budget. Plywood panels were a more economical choice, although still a temporary solution meant to last just a year or two (at least until money becomes available for Plexiglas). The dreaded but hopefully temporary plywood winter panels. Nobody was particularly thrilled with the plywood option, since they make the interior of the lounge feel like the inside of a submarine. However, after applying thick coats of roofing sealant and then painting them over, they should be able to keep some of the cold out when the time comes. of poncho liner insulating curtains inside the lounge. some kind of weird alien from outer space. Plywood offers absolutely minimal insulation, of course. 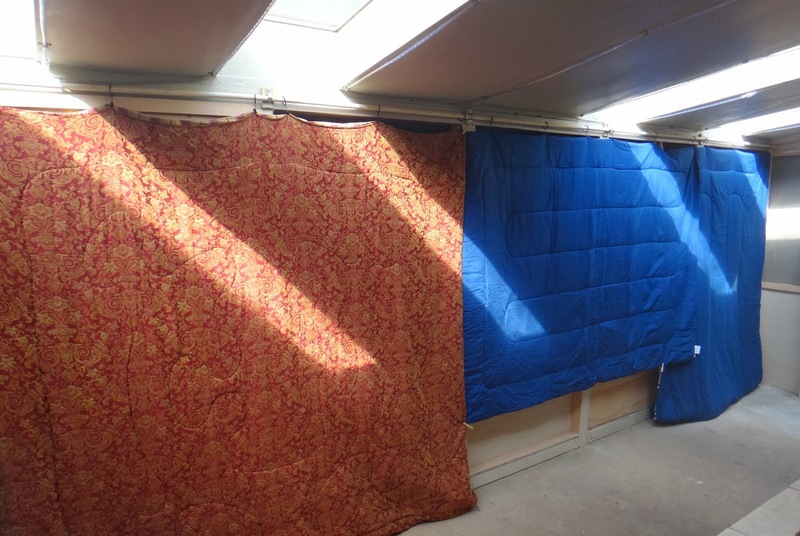 For this reason two sets of curtain rods were installed behind the benches inside the lounge for hanging insulation blankets. thick comforters in front of the bales and benches -- and in front of the outer doors -- should adequately seal out the cold, while at the same time protecting a significant northern portion of the Main House itself. In the meantime, the curtain rod in front of the benches is certainly handy for drying sheets! 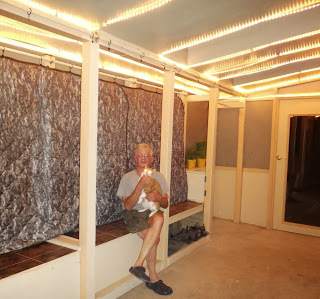 In fact, Valhalla's Park Lounge still needs some important finishing touches. It would be best to install a non-slip tile floor that can be quickly hosed off after any messy projects, which would also involve installing a floor drain. Thick rubber anti-fatigue mats would also be most useful, especially for those Valhallans who have physical challenges to deal with, and then Plexiglas panels are also at the top of the wish list. Remember that a very significant amount of effort, time, and money has already been invested into building the lounge, and with your help it will be completely finished before the snow flies! Thank you so much for your support! Nobody, including cadre or board members, draws a paycheck here, nor will they ever: we simply give everything we have to make Valhalla possible. 100% of your donation via Paypal will go directly to program expenses, period. Press the "Donate" button above to contribute $10, $20, $50 or even more to directly benefit participating combat veterans. They have defended all free people, now it's our turn to give back to them!